The inspiration was drawn from Chinese lanterns, an old handicrafts work. Every lantern festival, people hang up red lanterns to celebrate family reunion and create a happy atmosphere. The outer material of the Velodrome was PC, and the form of a saddle was a response to the necessity of the cycling track. The skin changes colour according to the game. A shape of lightness looks like a cloud, and the soft colour of outer walls eliminates the spatial pressure of the architecture on surroundings. 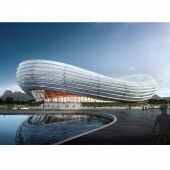 This architecture is intended to be one of the most important sports facilities in Chongqing, also a landmark of the city. We attempted to make possible an architecture of modern creation and inspiration, and this does not mean we failed to consider a sense of traditional Chinese features. 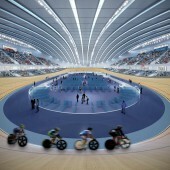 The Velodrome could accommodate 6000 audiences at most. The wooden cycling track indoor has a length of 250 metres. After completion, it could serve the highest standards of UCI competitions. 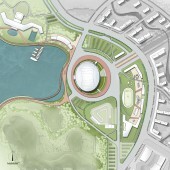 The overall planning of the site not only highlights the main body of facilities and fields of extreme sports, but also announces the multiplicity of the central park. During non-game period, the park is open to all citizens, thus providing a friendly local community. The idea of the planning is the combination of vitality and tranquility. 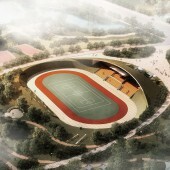 The site has an axis cutting through the Velodrome, separating the vitality area of commercial walks of sports culture, roller skating and extreme sports field, BMX sports field, and exhibition centre, as well as the tranquility area of athletes apartment and pub valley. The project is located in Chongqing, and the design was completed in 2016. Construction of the project is expected in the coming few years. Specifically a cable net structure makes a light roof because the steel cable is not heavy, so there is no need to use large lifting equipments in the construction of the roof. The Velodrome covers a total area of 32000 square metres, with three floors above the ground, which could accommodate 6000 audiences, and also meet the requirements of UCI games. The dome has a light cable net structure. It reaches 150 metres in length and 120 metres in width. The cycling track has a total length of 250 metres. The safe speed of athletes in game ranges from 85km/h to 110km/h. The slope angle of the whole track is between 13 to 45 degrees, and the angle has a gradual change, so the precision of construction is highly demanded, which is also a technical difficulty of this project. 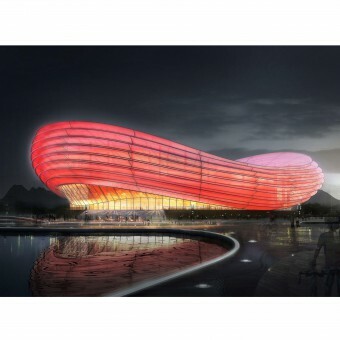 The design of the architecture was first based on a previous academic work of collecting, analyzing, and comparing built Velodrome precedents worldwide, and then a deep and thorough study of requirements of all categories of relevant games. Besides being functional, we also considered local natural environment and cultural geography of the region, so we made use of elements of local culture and traditions in the creation of modern architecture. Furthermore, the design also took into account the sustainable tactics as a response to the idea of being environmentally friendly and energy saving. The highest safe speed on the track ranges from 85km/h to 110km/h, and the slope the surface is between 13 degrees to 45 degrees. There is a continual change of the slope angle of the whole track, so the precision of the construction is highly demanded. Image #1: Illustrator Aoyan Chen, Night View of Velodrome, 2016. Image #2: Illustrator Aoyan Chen, Daytime View of Velodrome, 2016. Image #3: Illustrator Aoyan Chen, Interior View of Velodrome, 2016. Image #4: Creator Aoyan Chen, Siteplan of Velodrome and Sports Park, 2016. Image #5: Illustrator Aoyan Chen, Birdview of Roller Skating Rink, 2016. 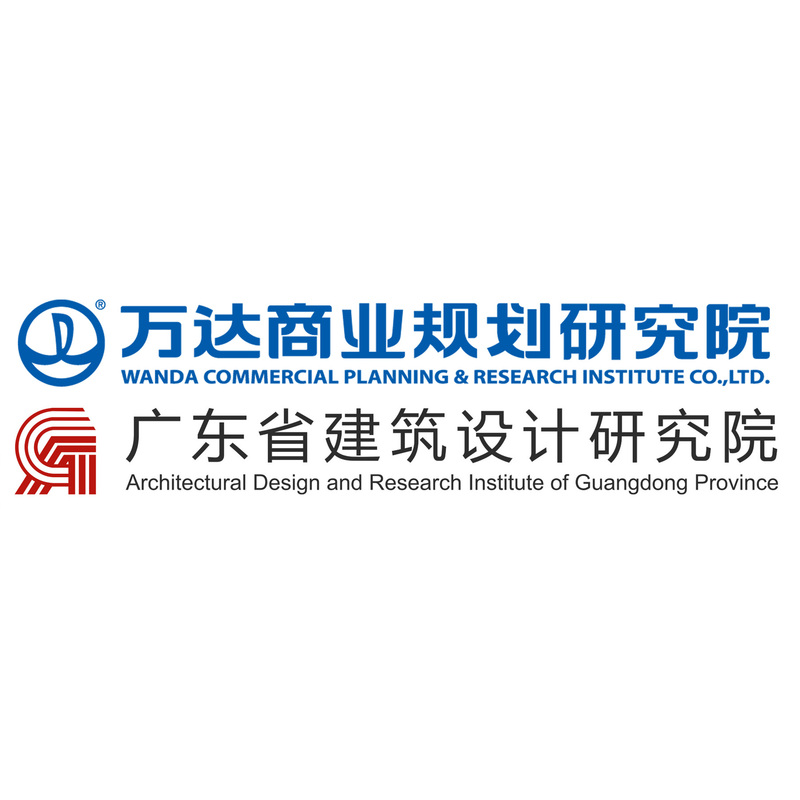 Architectural Design and Research Institute of Guangdong Province (GDAD) founded in 1952, is one of the earliest large integrated construction survey and design units. In the process of serving the state and local places, the workforce has grown continuously, the technology strength has been gradually enhanced and the business scope has expanded. Thus, the institute has become a highland in the architectural science and technology research in Lingnan Area and important force for the urban and rural construction of new China. With strong technical force, GDAD has formed a talent team with good quality, reasonable structure, complete engineering fields and remarkable efficiency, including member of Chinese Academy of Engineering, national engineering design master, experts enjoying the Government Special Allowance, various registered engineers and other top talents in the industry. GDAD has actively expanded the market throughout the country, set up a number of branches with separate design teams, and formed the service development pattern by taking Pearl River Delta region as the focus, covering Yangtze River Delta, Bohai Sea region, Southwest region and west development area as well as spreading all over the country; GDAD is also committed to learning various advanced design concepts as well as science and technology, treat the blend of different architectural cultures with an open, inclusive and pragmatic attitude, and it has cooperated with the design companies in dozens of countries and areas, including the United States, Canada, Russia, Britain, France, Germany, Austria, Australia, Saudi Arabia, Japan, Hong Kong, Macao and Taiwan, so as to continue to enrich the local architectural culture and gradually form the development trend focusing on Guangdong Province and facing the whole world. The client Wanda Group was established in 1988 and has developed into a conglomerate of commercial properties, culture, Internet and finance. It ranked 385th on the Fortune Global 500 List in 2015. In 2016 its assets amounted to 796.2 billion yuan with operating revenue of 255 billion yuan. By 2020, Wanda Group aims to become a world class multinational corporation with assets of $200 billion, market capitalization of $200 billion, revenue of $100 billion and net profits of $10 billion. Chongqing Wanda Velodrome Cycling Sports by Wanda Cpri & Gdad is a Nominee in Architecture, Building and Structure Design Category. · Click here to register today inorder to be able to view the profile and other works by Wanda CPRI & GDAD when results are announced. Chongqing Wanda Velodrome Cycling Sports by Wanda Cpri & Gdad is Winner in Architecture, Building and Structure Design Category, 2016 - 2017. · Press Members: Login or Register to request an exclusive interview with Wanda CPRI & GDAD. · Click here to register inorder to view the profile and other works by Wanda CPRI & GDAD. Did you like Wanda Cpri & Gdad's Architecture Design? Did you like Chongqing Wanda Velodrome Cycling Sports? Help us create a global awareness for good architecture design worldwide. Show your support for Wanda Cpri & Gdad, the creator of great architecture design by gifting them a nomination ticket so that we could promote more of their great architecture designs.